Bug tracking starting to feel like whack-a-mole? 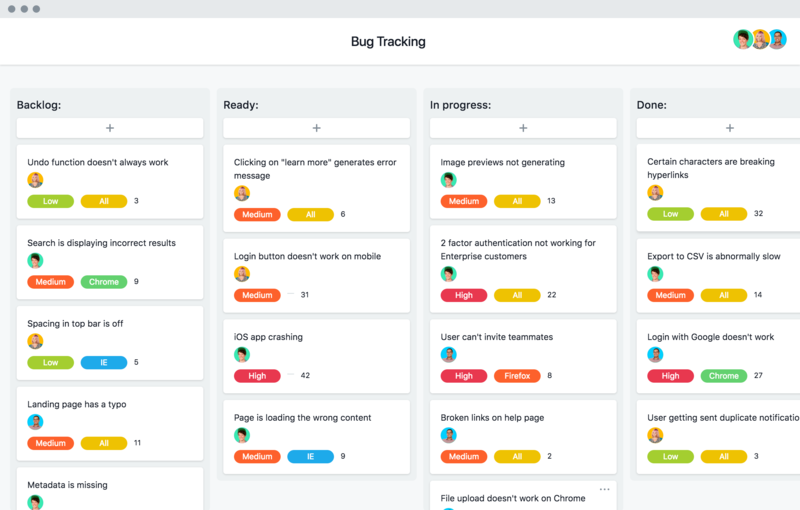 Report, track, and prioritize all your bugs with this template. Report on and collect bugs one place. Instead of getting a barrage of reports across various channels or wasting time trying to get more details, bug reporters can use a template task or form so you have all the information you need, all in one place. Identify who’s fixing the bug, when. When a bug is worth fixing, assign the bug report to a teammate with all the details and give it a deadline to make it clear who is fixing it and when. Keep priorities clear. Some bugs break important processes, while others can be dealt with later on. Keep your team focused by using custom fields to show priorities to ensure big problems get fixed fast. Spot patterns with sorting. As you track bugs, custom fields can help you sort by categories to see patterns and get a pulse on the types of bugs you have. Bugs are a problem. Tracking them improperly leads to even more infestations. Instead try our tips. How do you prioritize and categorize bugs to know what to tackle first? We'll show you. A template gets you started, but a free trial of Asana Premium trial keeps you going.